The nation's largest snack maker, Nongshim, made a public apology Tuesday for one of its best-selling items containing the head of a small rodent. The company shut down the snack production line, and supermarkets are already removing them from their shelves. The apology came after gray skin-like material, 1.6 centimeters in length, was found last month inside a jumbo-sized Nongshim snack, ``Saewookkang'' (shrimp snack). The Food and Drug Administration on Monday issued a correctional order to the snack manufacturer. The ``material'' was very hard and covered in oil and burnt hair, and it also had the remains of eyes and a nose, which led the administration to conclude it to be the head of a rat. A customer had reportedly called Nongshim asking for a refund and a recall on all of its product made on that day. Initially her requests were denied. However, later the company tried to compensate her and recalled all the products in the market, she said. The company explained that a factory in China makes the dough and sends it to a factory in Busan to fry, pack and distribute it. ``I doubt the frying process in Busan is unhygienic, but we are looking into the possibility of the material being added during the dough process at our factory in China,'' a Nongshim spokesman said during the public apology. However, the market has already plummeted over the news. E-Mart, Lotte Mart, Home Plus, Homever and several other large supermarket chains decided on Monday to stop selling the snack indefinitely. The online world is abuzz over how the matter could have passed the three-step inspection at the Busan factory and how Nongshim should be punished. The FDA has only given a correctional order. ``What gets me angry is that the company tried to play the whole thing low key and I ate several bags of Saewookkang,'' an angry netizen (ID: KTU) said. 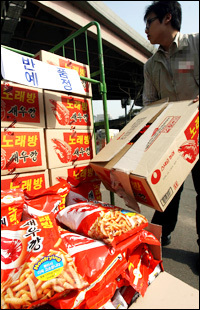 The fact that Nongshim has raised the snack price by 100-200 won due to rises in raw materials prices earlier this year is adding to public anger, experts said.